A local TV station on Tuesday aired footage of two young men or boys stealing Divvy bikes from a docking station. In the video, the kids use the same general technique that our chief editor saw Divvy thieves use outside the Daley Center and again at Washington Square Park weeks ago. Divvy told us in our original report that the company is “retrofitting all of our docks with stronger, more tamper-proof lock mechanisms.” They’d better step on it. A CWBChicago reader reported that Divvy workers were servicing the bike station at Clark and Elm on Tuesday, one day after CWBChicago retweeted a photo taken by a reader that showed three men apparently stealing bikes from the station on Saturday. The photo shows two men sitting on locked Divvy bikes, apparently pedaling and manipulating the handlebars. A third man is backing his bike out of the station. In addition to working on the station’s lock mechanism, a camera was installed at the station, according to our reader. But does the camera actually work? We’ll leave that to your imagination. Another significant development: Late last week, the Chicago Police Department issued a citywide bulletin to show officers the best way to document thefts of Divvy bikes. The announcement was released by the 18th (Near North) Police District, which protects the Magnificent Mile, River North, Old Town and the south end of Lincoln Park. The district has been leading the way in making Divvy bike arrests over the past three weeks. 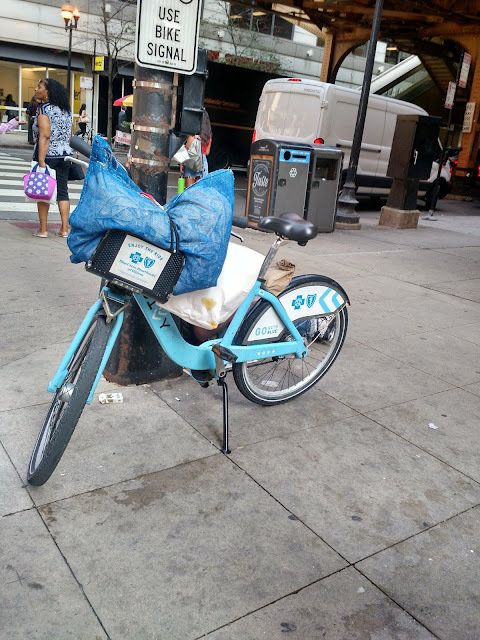 Divvy stations downtown and in the Old Town neighborhood have been particularly hard hit by the theft wave. In a brazen move, the man seen below was recently seen standing outside of 30 West Chicago, offering to sell a Divvy bike to passers-by in broad daylight. • Police saw Leonard Edwards, 50, panhandling with a Divvy bike next to him in the 600 block of North McClurg on the afternoon of July 14th. Edwards initially claimed that he rented the bike, then claimed that he paid “someone” $8 for it, police said. Regardless, according to Divvy, Edwards’ bike was stolen on July 4th. He was arrested. • Anton Phillips, 45, was stopped for allegedly riding a Divvy bike on the sidewalk in the 700 block of North Dearborn. A check of the bike’s status showed that it had been stolen on July 7th, police said. Phillips was arrested. • Cops said they saw an unattended Divvy on the sidewalk in the first block of West Huron around 10 a.m. last Thursday. They called Divvy with the serial number. As the officers waited for a report on the bike’s status, 51-year-old Joseph Marrow walked up, hopped on the bike, and pedaled away, officers said. Marrow was stopped and arrested after a Divvy rep told the officers that his bike had been stolen on June 28th. Finally on the justice front, a 26-year-old South Side man who was charged with having a stolen Divvy at State and Chicago on July 3rd pleaded guilty to theft of lost or mislaid property on Monday. Joshua Hallman received a sentence of eight days time served from Judge Anthony Calabrese. 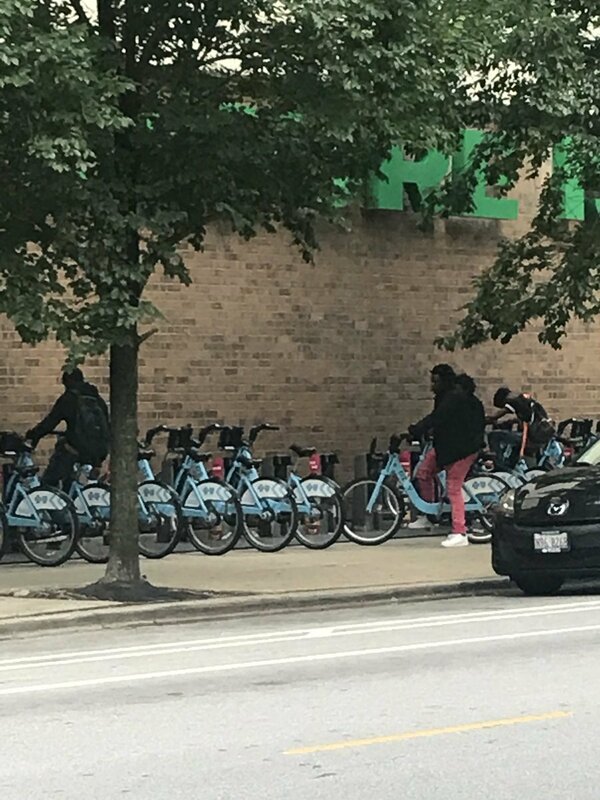 There is still no shortage of stolen Divvy bike chatter on social media. Divvy is asking people who find abandoned bikes to return them to the nearest docking station. @DivvyBikes found one of your bikes abandoned in the bushes in the park. Called customer service but there was no answer.